Statistics show that one out of three seniors will fall this year. In fact, falls are the leading cause of injuries in older adults aged 65 and older. 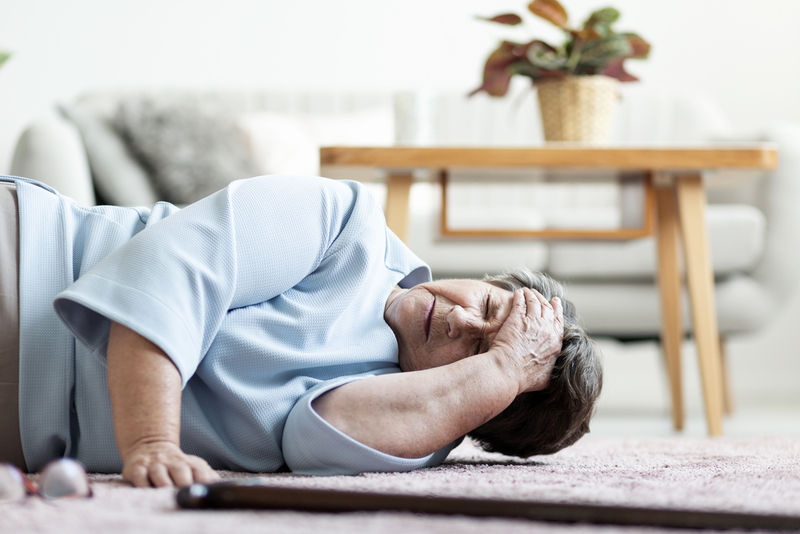 A fall for an older adult can cause serious cuts, hip fractures, and even head injuries. Click To Tweet Utilizing a fall prevention plan can help lessen fears and keep older adults safe from falls. Creating a safe place and taking the correct precautions will help reduce the risk of falling for your elderly loved one. Here are eight important tips to help reduce the risk of falling. The first step in preventing falls is to talk to your loved one’s doctor. Be prepared to answer questions about medications being taken, whether the person has fallen before, and also if there are any existing health conditions that might increase the risk of falls. It might surprise you, but staying active and physical can go a long way toward fall prevention. Staying active with gentle exercise like water aerobics, tai chi, and walking helps build balance and strength in seniors. Check out your community for what senior activities are available in your area. Many times a fall could’ve been prevented if they were wearing proper non-slip footwear. High heels, floppy shoes, or slick-bottomed footwear can actually increase falls in older adults, so make sure your loved one is wearing nonslip and properly fitted shoes. Cleaning up their living space is another way to decrease falling possibilities. Remove any unnecessary boxes or cords from walkways, and move tables and chairs from high-traffic or common walking areas. Keep items that might become a tripping hazard put away, and make sure things that are frequently used are easily accessible and in reach. Keep your home brightly lit to avoid tripping on hard-to-see items. Place nightlights in the hall and rooms that your loved one might need to go in the evenings and make sure that there are clear paths to the light switches so they are easily accessed. Safety devices like grab bars in the bathroom and handrails on the staircase are vital in preventing older adult falls. Gary Kaplan, DO, founder and medical director of the Kaplan Center for Integrative Medicine, suggests installing these handy bars and rails throughout the hallway, as well. Any area that poses a slipping hazard could use nonslip mats. Bathtubs, showers, kitchen, and bathroom floors are dangerous when wet and nonslip mats can help them become safer. There are a plethora of support devices on the market to help your older loved one stay safe from falls. Raised toilet seats, walkers, canes, or even wheelchairs might need to be used in order to decrease the risk of falling. If you have an aging parent, grandparent, or loved one in your life, help them reduce their risk of falling by following the above tips. Being proactive in fall prevention is a great way to help your senior loved one stay healthy and independent as long as possible. Seniors at risk of a fall need constant company and assistance, which is an impossibility for most busy families. That’s what makes assisted living cottages such a great alternative to caring for your loved one alone. It’s the best of home with the safety provided by a caring assisted living staff. Contact us to learn more tips for fall prevention, or to tour one of our cozy cottages.